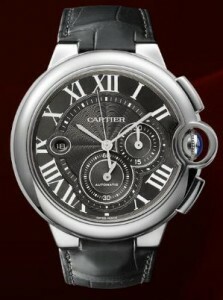 The Ballon Bleu de Cartier Extra-Large Chronograph - In dark style, my personal favorite among those I've seen. 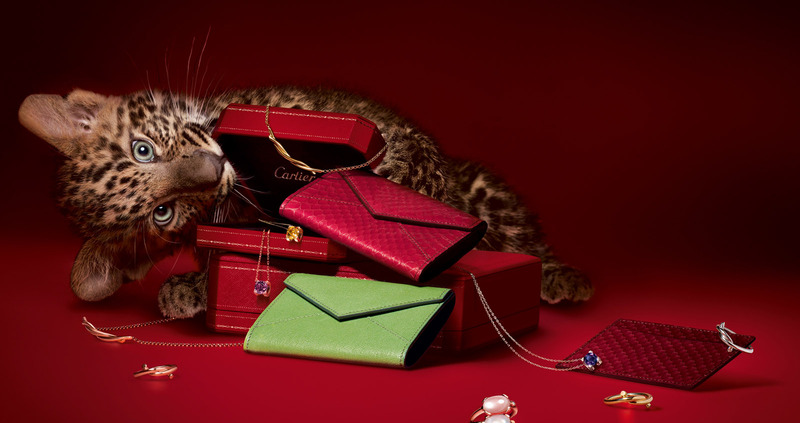 Cartier has been making luxury watches for over a hundred years, so anything from them is sure to be a high-quality product with a functionality, aesthetic appeal, and price tag to match. The Ballon Bleu line is relatively recent, only about 4 years old, but the Ballon Bleu de Cartier Extra-Large Chronograph W6920052 is no less impressive for it. The design is dark and almost mysterious. A round case of stainless steel rests on a black wrist strap. The strap is made of alligator skin. Double-adjustable deployment buckles also assure a comfortable fit as well as a stylish one. The clock face is a black wafer, adding another comfortably low-key but highly stylized flair to the watch’s elegance. An interesting combination of nostalgic and futuristic is found here; being a chronograph, the sleek and well-crafted dials for the date and for chronograph minutes and seconds are recessed in the face, indicative of the advanced technology used in the watch’s construction. And ringing the watch is a traditional roman numeral designation for hours – only nine, though, as those for 3, 6 and 9 are covered respectively by the aforementioned date, seconds, and minutes displays. Clear tick marks on the outer edge of the face still make telling the exact time easy. Possibly the flashiest part of the watch is also the smallest: the control dial. Shining steel houses a synthetic sapphire, and the blue is a noticeable contrast with the otherwise black-and-silver colors of the watch. It stands out conservatively and has a great eye-catching quality without contrasting too sharply. I very much like the design of this watch. A few things one should consider before springing for this timepiece, though. Priced at $10,300, this watch is absolutely an upper-class purchase, as one can expect from Cartier. Anyone without a significant paycheck should likely check a lower-end model ( Although, to be fair, exact copies of this model with only differing materials can add at least $4,000 to that price tag). Being a luxury watch, were it to break, repairs would be expensive. And lastly, this is in fact the extra-large model. With a 44mm diameter and being 14.8mm thick, this particular watch may overwhelm the small of wrist along with the tight of wallet. As far as large watches go, though, it is a rather unobtrusive one; the style of the Ballon Bleu is very subtle, which I personally find very appealing. With a strong name like Cartier and a material composition that earns its price, a perfect balance of simplicity, functionality, and style, the Ballon Bleu Extra-Large Chronograph is a grand addition to one’s wardrobe and tools alike.